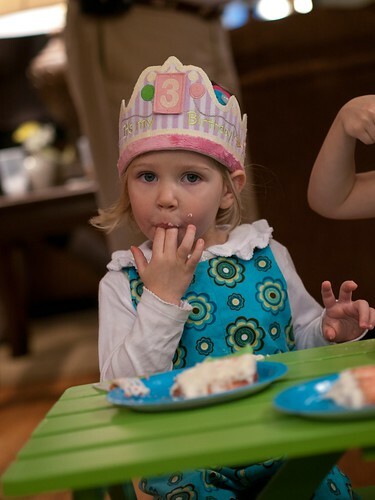 We flew to Birmingham to celebrate Emmie's 3rd birthday. It didn't take long upon our arrival before the girls all headed to the play room. 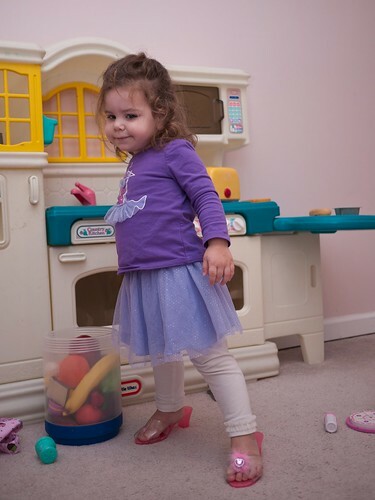 Nice shoes, Leah! Emmie is so intent on using her computer that she has no idea Molly is about to give her a trim. 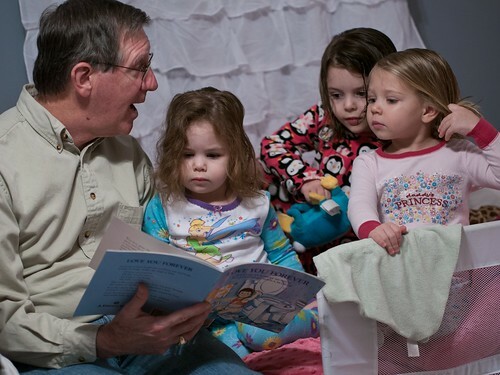 Grampa was appointed head book reader at bed time. 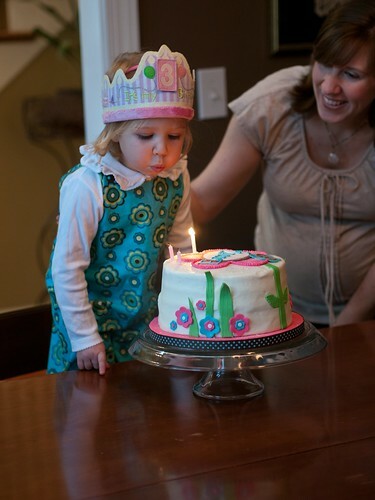 Emmie was insistent on having a flower party, so Aunt 'Chelle got creative with the flower theme. 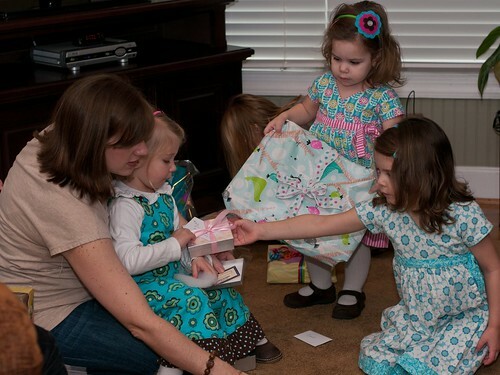 Naturally, Molly and Leah were eager to assist with the present opening. It was finger lick in' good! 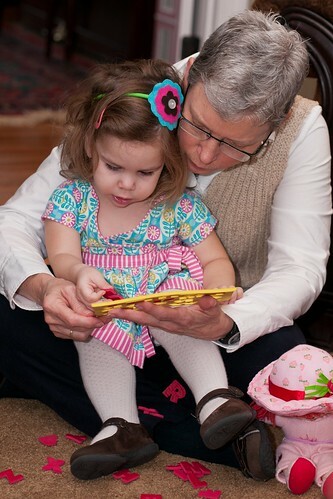 Leah took a quick break from the party festivities to assemble the alphabet with G'mom. 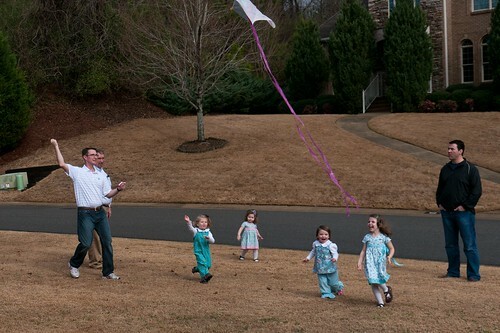 Emmie also got a kite, which was then of course flown. 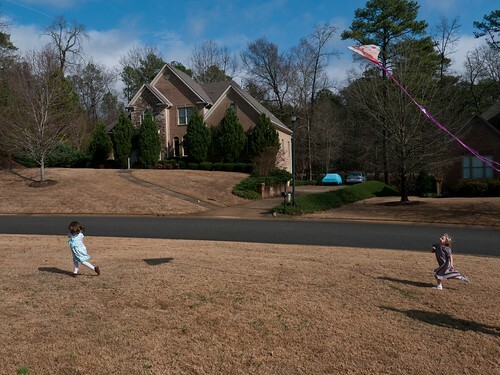 Apparently it's just as much fun to run after someone flying a kite as it is to fly it yourself. Molly flying with Tate chasing. An image of timeless childhood. 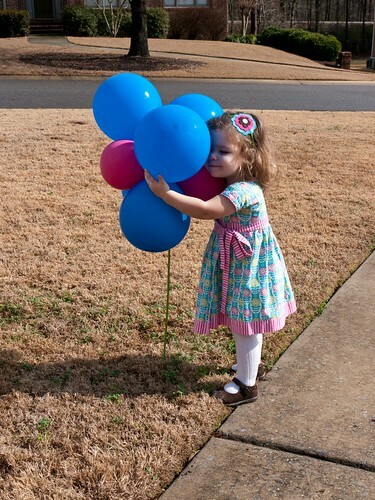 Leah thought the flower balloons needed a bit of love. 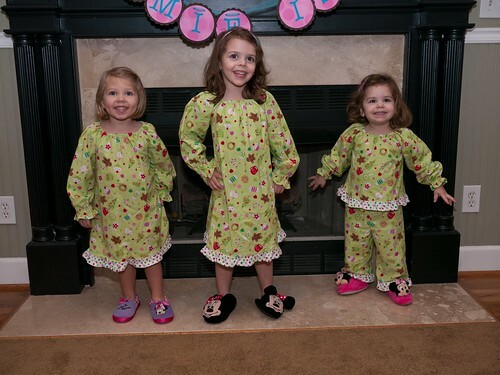 The girls were finally all together to wear the Christmas jammies I made them. It was like Christmas Eve in January. 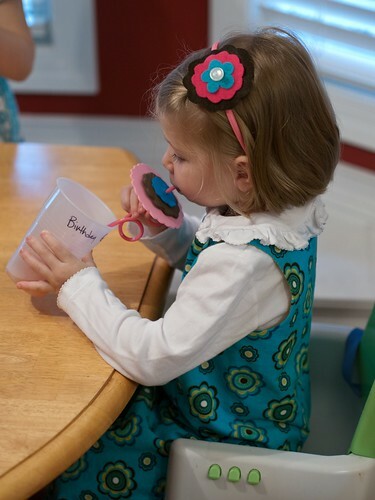 Emmie may be one of the few kids her age that knows what a chalkboard is. For those who don't, it's an upright display you write on with chalk while you stick out your tongue. 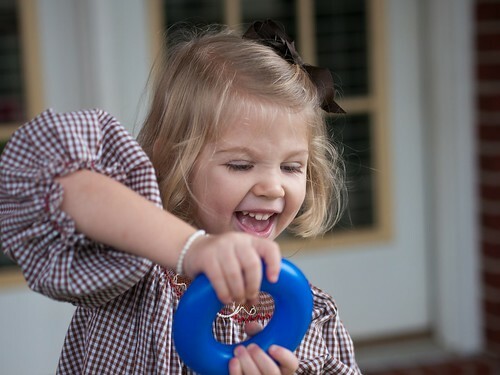 Baby rings can turn into steering wheels when you get older. And the post the baby ring comes from can become a microphone. We transitioned Leah into her big girl bed this weekend. She keeps saying "I love my bed!" 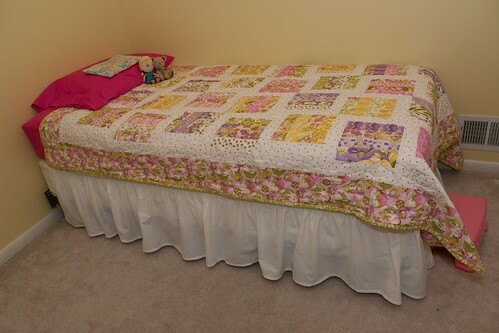 My aunt made Leah's new quilt. Molly noticed that the fabric matched the valance I made a few months ago. Nice observation kiddo! 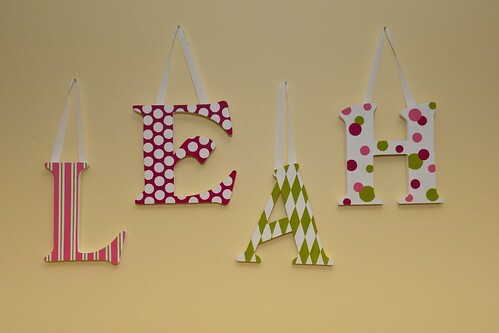 Like I did for Molly, I painted Leah's letters to match her new room. 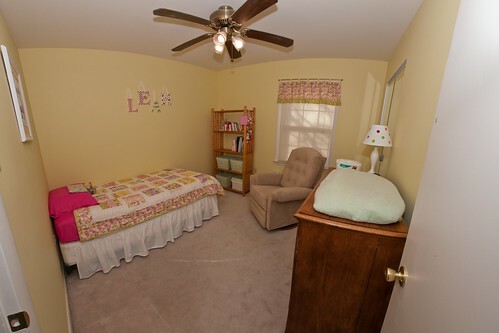 Here's the completed room, using Chad's new ultra-wide lens to capture all four walls. 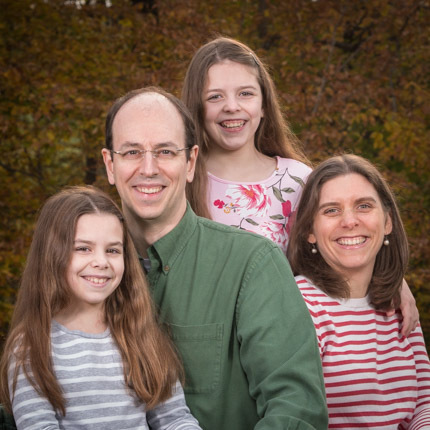 I kept thinking that we were transitioning Leah much earlier this time. 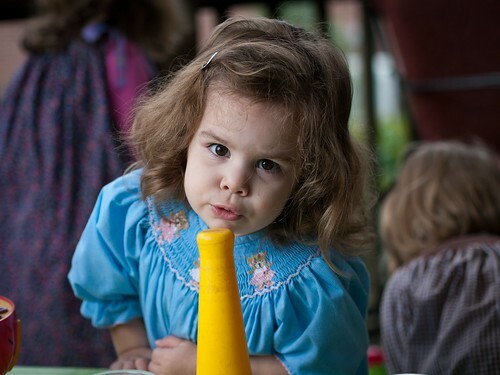 Turns out, Molly was actually 1 day younger when we transitioned her. The first night went great, except that Chad accidentally set the alarm when resetting the clock and it went off at midnight! Thankfully she went right back to sleep. And both girls are sticklers when it comes to routine, so we've had to work through a few issues like the new step stool at the end of Leah's bed and the new lamp on her dresser. Funny enough, the new bed has been welcomed with lots of smiles and bouncing fun. I set up a playdate at Molly's gymnastics club for Leah and some friends to play. Leah always has to sit back and watch at Molly's practice, so she was super excited to get to play this time. She knew exactly how to freeze after jumping on the tumble track. 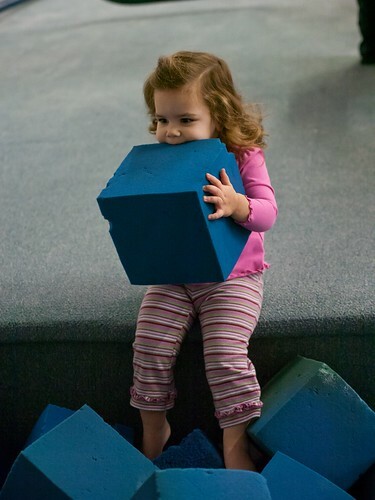 Leah was only willing to get in the foam pit once. After that, she was happy to play with the blocks from the side. Hmm, might not be the best snack idea. Leah has been constantly dancing around the house since The Nutcracker so we decided to sign her up for a dance class of her own. Molly's studio has a Creative Dance class for 2 year olds, so we're giving it a go. Here's Leah ready to go to her first class and very excited about it. 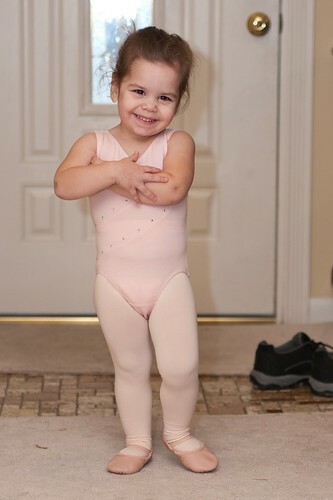 As you may have read lately, Molly really enjoys ballet. 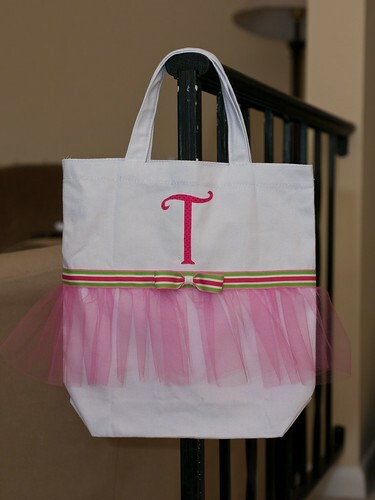 Most of the time, her ballet slippers and skirt end up in my purse, so when I saw the idea for a tutu tote, I knew I (ahem, she) needed one to tote all her dance accessories. 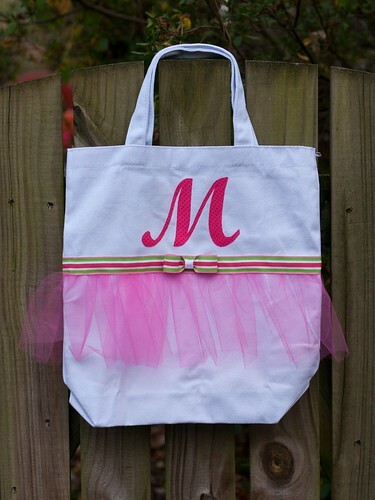 I also made one as a birthday gift for Molly's friend, Taryn, since she takes ballet too. And that concludes this year's handmade holiday gifts. In case you missed any, here is a recap. Chad's grandmother is always in favor of a good glass of wine, so I made her this quilted wine tote. 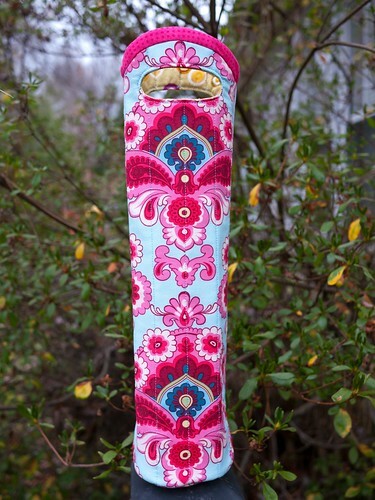 It's insulated, so it will keep the bottle nice and chilled. Since Chad and I do not drink, finding a bottle to test the size was a bit of a challenge in my house. Thankfully, I had a bottle of cooking Sherry which fit like a charm!